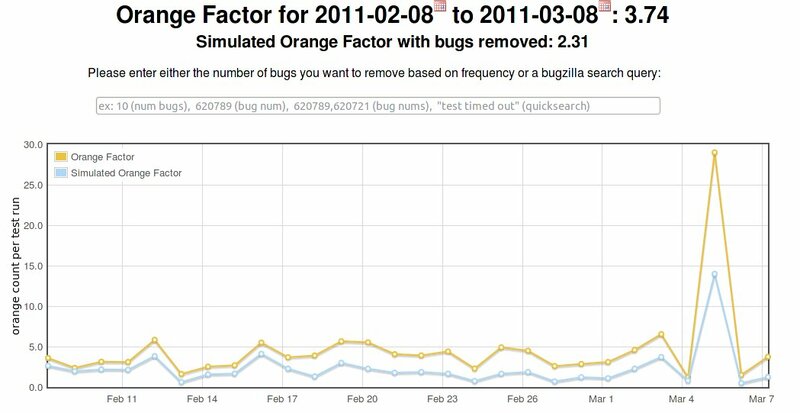 A few weeks ago we (jgriffin, mcote, jhammel, ctalbert and harth) had finished most of the bugs and requests that had been made for Orange Factor. We also did a lot of rework to move it away from couchDB. Here are some highlights and features that make Orange Factor better. For reference, here is the original post I did announcing orange factor. You will notice that we default to the last month for the time range. This can easily be edited by clicking the little calendar icon by the dates (on any page). Also, we have drop down menus to filter the overall orange factor view based on platform, build type, branch, and test type. Alternatively, you can enter a bugzilla (quicksearch) query here to see a list of bugs that are related to orange factor. In this graph, you can see that we have a legend for 4 lines, but only two are showing. You can toggle the lines on/off. Speaking of TBPL, when you star an orange, the data is pushed into our database. This database is hosted by the metrics team and stores log files and tbpl data. Actually we pull from that directly and can calculate by test run instead of by raw number of hg pushes. All of this gives us significantly more accurate data than before with a design that can support other branches. Another thing we improved was to not store bugzilla titles in the database. These change over time and waste a lot of space. Instead we query BZApi to get the title for each bug we are currently displaying. Another thing we do with bugzilla is harthur added to the bztweaks addon so we can display the orangefactor for a given bug while viewing it in bugzilla. Lastly we have a weekly email that goes to dev.planning which lists the top 10 bugs from the past week and some stats about them. All in all we fixed about 60 bugs, but feel free to file more.